We must struggle by solemn fast and by works of charity against our passions, and “the Lord will give us rest, and will fill our souls with brightness.” The rough sea and the contrary winds are a figure of our passions. In this hard struggle Jesus will come to our help as He did to the Apostles and heal our bodies and our souls by fasting, as He healed all the sick in the land of Genesareth. Hear, O Lord, our humble prayers, and grant that we may devoutly keep this fast that has been established to cure our souls and bodies. Through Jesus Christ our Lord, Who liveth and reigneth with Thee in the unity of the Holy Ghost, one God Forever and ever. R.Amen. Lesson from Isaias the Prophet. Thus says the Lord God: If you remove from your midst oppression, false accusation and malicious speech; if you bestow your bread on the hungry and satisfy the afflicted; then light shall rise for you in the darkness, and the gloom shall become for you like midday; then the Lord will guide you always and give you plenty even on the parched land. He will renew your strength, and you shall be like a watered garden, like a spring whose water never fails. The ancient ruins shall be rebuilt for your sake, and the foundations from ages past you shall raise up; ‘Repairer of the breach,’ they shall call you, ‘Restorer of ruined homesteads.’ If you hold back your foot on the Sabbath from following your won pursuits on My holy day, if you call the Sabbath a delight, and the Lord’s holy day honorable; if you honor it by not following your ways, seeking your own interests, or speaking with malice – then you shall delight in the Lord, and I will make you ride on the heights of the earth; I will nourish you with the heritage of Jacob, your father, for the mouth of the Lord has spoken. At that time, when it was late, the ship was in the midst of the sea, and Jesus alone on the land. And seeing His disciples straining at the oars, for the wind was against them, about the fourth watch of the night He came to them, walking upon the sea, and He would have passed by them. 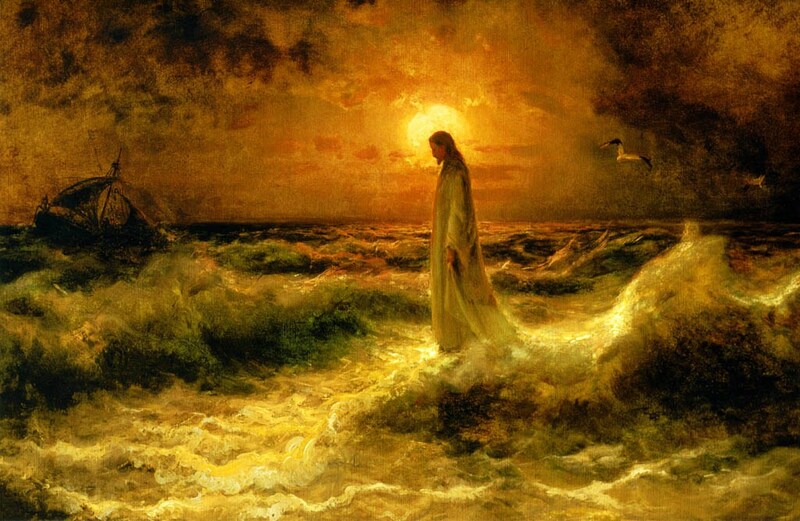 But they, seeing Him walking upon the sea, thought it was a ghost, and cried out. For they all saw Him, and were troubled. Then He immediately spoke to them, and said to them, Take courage; it is I, do not be afraid. And He got into the boat with them, and the wind fell. And they were utterly beside themselves with astonishment, for they had not understood about the loaves, because their heart was blinded. And crossing over, they came to the land of Genesareth and moored the boat. And when they had gotten out of the boat, the people at once recognized Him; and they hurried through the whole country, and began to bring the sick on their pallets, wherever they heard He was. And wherever He went, into village or hamlet or town, they laid the sick in the market places, and entreated Him to let them touch but the tassel of His cloak; and as many as touched Him were saved. Receive, O Lord, this sacrifice by which You have graciously willed to be appeased: grant, we beseech You, that, cleansed by its effects, we may offer You the love of our hearts as an acceptable gift. Through our Lord Jesus Christ Thy Son. Who liveth and reigneth with Thee in the unity of the Holy Ghost, one God Forever and ever. R.Amen. Fortified by the Bread of Life, we beseech You, O Lord, that what is a sacrament in this life may become a help to life eternal. Through our Lord Jesus Christ, Who livest and reignest, with God the Father, in the unity of the Holy Ghost, one God For ever and ever. R. Amen. May Your faithful people, O God, be strengthened by Your gifts; that by receiving them, they may still desire them, and by desiring them, may evermore receive them. Through our Lord Jesus Christ, Who livest and reignest, with God the Father, in the unity of the Holy Ghost, one God For ever and ever. R. Amen.